ASHTABULA, Ohio, May 8, 2012 (ENS) – The U.S. Justice Department and Ohio Attorney General have reached a proposed settlement of claims for injuries to natural resources caused by past releases and discharges of hazardous substances into the lower Ashtabula River and harbor on Lake Erie in northeast Ohio dating back to the 1940s. The consent decree, valued at $5.5 million, was filed Thursday in the U.S. District Court for the Northern District of Ohio on behalf of the natural resource trustees, including the Department of the Interior, National Oceanic and Atmospheric Administration and the Ohio Environmental Protection Agency. “This agreement will compensate the public for precious natural resources that were damaged by hazardous pollutants released into the Ashtabula watershed over more than half a century,” said Ignacia Moreno, assistant attorney general for the Environment and Natural Resources Division of the Department of Justice. The settlement provides for the acquisition of several ecologically-valuable properties along the Ashtabula River, implementation of habitat restoration projects and land use restrictions to protect restoration properties and reimbursement of natural resource damage assessment costs incurred by the trustees. 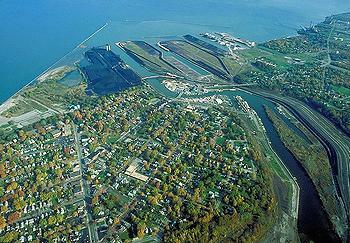 Since the 1940s, numerous industrial facilities in Ashtabula released hazardous pollutants to the river, including polychlorinated biphenyls, polycyclic aromatic hydrocarbons, chlorinated solvents and low-level radioactive materials, according to complaints filed in court by the United States and state of Ohio. The hazardous substances injured natural resources in the Ashtabula River and harbor, resulting in fish consumption advisories and impaired navigational use of the river. To compensate the public for the value of impaired or lost natural resources, the United States and the State of Ohio sought damages from parties that owned or operated facilities where hazardous substances were released and from parties that allegedly arranged for disposal of hazardous substances at the facilities. Eighteen companies are participating in the settlement. Several federal agencies as well are responsible for making payments totaling approximately $768,800. The responsible parties previously contributed approximately $23 million toward the cost of the sediment cleanup, and many of the parties also participated in a cleanup of the Fields Brook superfund site, an alleged source of contamination in the lower Ashtabula River. Dredging projects carried out under the Great Lakes Legacy Act and the Water Resources Development Act removed 600,000 cubic yards of contaminated sediments from the lower Ashtabula River between 2006 and 2008. The proposed settlement agreed on Thursday targets habitat enhancement and protection. Under the consent decree, restoration projects approved by the natural resource trustees will be implemented by two groups of responsible parties – a group of four railroad companies and a separate group of 14 companies known as the Ashtabula River Cooperating Group II, known as ARCG II. The railroads will restore a 6.4 acre riparian parcel known as the 5½ Slip peninsula, which abuts a fish habitat enhancement project constructed as part of the Great Lakes Legacy Act sediment cleanup project. The restoration will replace invasive plant species with native plants. A channel will be excavated across the peninsula to establish a hydrologic connection between the 5½ Slip and main channel of the Ashtabula River, and an area of emergent wetland habitat along the newly constructed channel will be encouraged. Land use restrictions will be established on the 5½ Slip peninsula to protect the character of the restored property. ARCG II has agreed to restore a 28-acre riverfront parcel along the northern boundary of Indian Trails Park. Restoration will include enhancing a six-acre wetland through invasive species control; planting native vegetation; and installing a canoe launch, boardwalk and small parking area for public use. Five other ARCG II restoration properties identified in the decree contain high natural resource value, including rare fen habitat, old growth forest and areas that provide ideal habitat and foraging for threatened or endangered species. These properties occupy more than 200 acres and include 3.4 miles of river frontage. Some adjoin or are close to park areas held by the Ashtabula Township Park Commission. Together, these properties will preserve a natural corridor along an urbanized stretch of river. In addition to restoration properties already acquired by ARCG II, the proposed settlement allows trustees to identify additional properties for possible acquisition and restoration. ARCG II agreed to spend up to $1.45 million to acquire and restore additional properties. The trustees will approve all restoration work. The restoration properties will ultimately be transferred to park districts, non-profit organizations or other institutions acceptable to the trustees. The properties also will be subject to environmental covenants that establish land use restrictions designed to preserve the natural resource value of the properties. The proposed settlement is subject to approval by the district court following a 30 day public comment period.